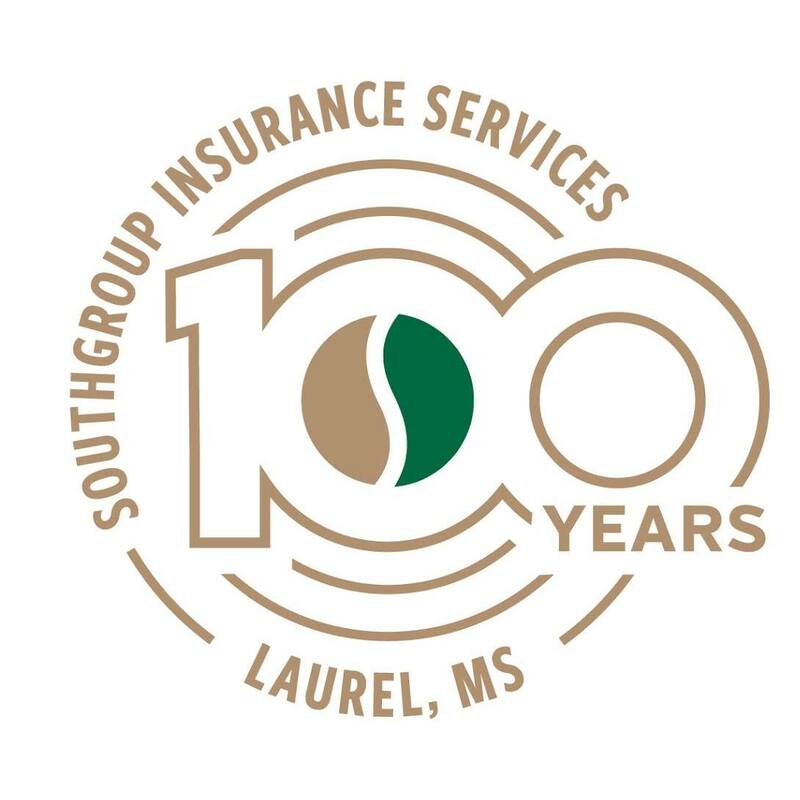 SouthGroup Insurance Services is celebrating their 100th anniversary this year. According to a Bloomberg report, 80% of businesses fail in the first 18 months. We admire their longevity and are pleased to share their story. The following is an interview with Laurel Branch President, Brad Kent. What is SouthGroup Insurance Services? SouthGroup Insurance Services is a full-service independent insurance agency. At our core, SouthGroup provides Property & Casualty and Life & Health insurance to businesses and individuals from a vast array of insurance carriers. However, from the perspective of a business philosophy, we are actively engaged in helping businesses and families assess and manage the risks they face in everyday life. Our mission is to manage risk and build personal relationships and partnerships in an environment of trust, integrity, teamwork and stability. How did SouthGroup Insurance Services begin? The story of SouthGroup, while unique, is a familiar story of business evolution like many family owned American businesses. We take great pride in the fact that we have been a locally owned and operated company for 4+ generations. Our agency has a very long history in Laurel, as we are currently celebrating our 100th birthday. In fact, we have continually served the people of Laurel and Jones County for 100 years. 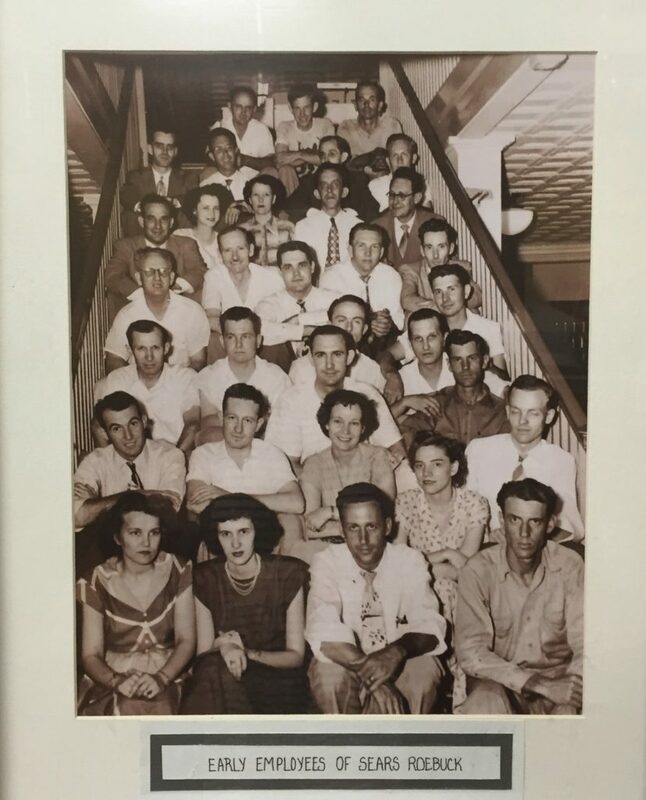 Our earliest roots date back to 1918 with the formation of the Graves, Lindsey & McLaurin agency which was located in the Pinehurst Hotel. 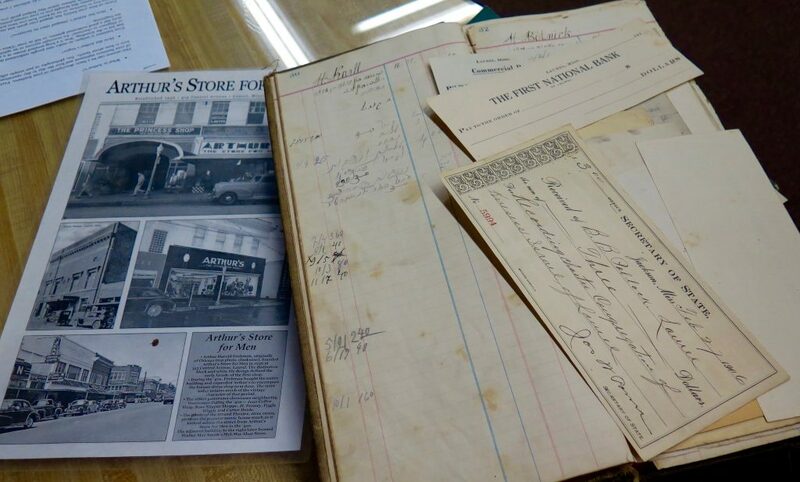 In 1929 the business moved into our current location on Central Avenue in downtown Laurel. My great grandfather, John H. Jones, grew up in Clinton, Iowa, as did several of Laurel’s oldest families. After a successful career as a publisher in Chicago, he ultimately moved to Laurel and opened the John H. Jones Insurance Agency whose first offices were also in the Pinehurst Hotel. Both Graves, Lindsey & McLaurin and John H. Jones continued successful independent operations in downtown Laurel until 1983 when a merger created Graves, Lindsey, McLaurin & Jones (GLMJ). At that time, the companies were operated by Russell Lindsey and my grandfather, Irwin “Skinny” Bradford. My grandfather died not long after the merger. That’s when my father, Charles Kent, took over as the 3rd generation to lead the agency. GLMJ continued success and consistent growth over the next 30 years. However, times change and industries evolve. Like many industries, market conditions over the last 20 years have changed and driven consolidation within the independent insurance industry. SouthGroup Insurance Services was first conceived in 2000 by a select group of insurance agency professionals from 12 of Mississippi’s leading insurance agencies. These agencies, widely recognized as industry leaders by their peers, convened to consider the challenges facing successful agencies and the solutions to these challenges that would enable them to offer an incomparable level of service to their clients. Those solutions were the genesis of SouthGroup. On January 1, 2002, with the official merger completed, those 12 original agencies began operating under the SouthGroup banner with corporate offices in Ridgeland. 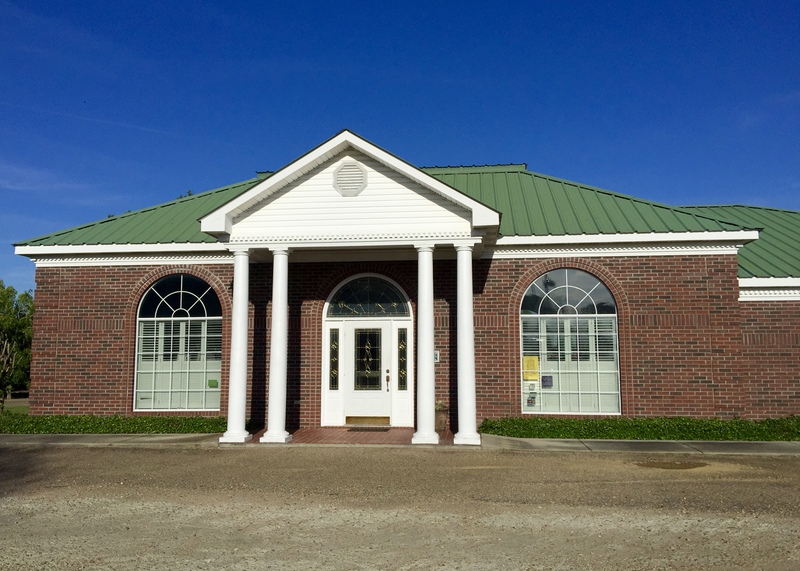 Today SouthGroup is the largest independent insurance agency in Mississippi with offices in 22 locations. SouthGroup is also 1 of 2 agencies on Insurance Journal’s list of Top 100 Privately-held Agencies in the United States. However, the unique quality that SouthGroup possesses compared with other large agencies is our “Main Street approach”. Rather than consolidating all of our offices, SouthGroup has continued operating in each location. This validates our strong belief in the importance of building close, personal relationships with our clients, and serving our local community. How do you think SouthGroup will be different 5 years from now? SouthGroup’s plans are to continue to grow. Like most businesses, technology is changing the way that we operate. Whether it’s internal technologies to make our business work more efficiently, utilizing social media platforms to engage the community or transacting business online, technology is changing our business all the time. Today SouthGroup operates “in the cloud” and strives to be as paperless as possible. I predict that we will continue to embrace technology, and therefore it will promote change that presents challenges, but also leads to increased profitability. Who do you want people to know about your services? First and foremost, we offer a valuable service to anyone that purchases insurance. As an independent agency, we do not work for a single insurance company. We offer choice, and choice is a vital necessity to promote competition, which leads to value. More specifically, SouthGroup remains the dominant business insurer in Laurel and Jones County. Whether you are a sole proprietor, or you operate a large enterprise, SouthGroup has the products and services to compete for your business. This includes general liability, commercial property, worker’s compensation, commercial auto and more. Our clients range from small “mom and pop” businesses to several of the largest employers in Jones County. What is your best advice for those looking to participate in the growth, revitalization and restoration of Downtown Laurel? 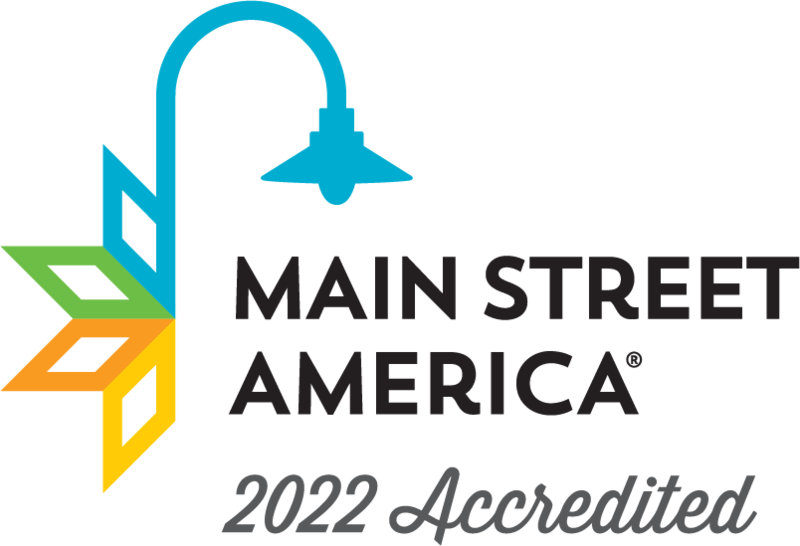 Our goal as Laurel Main Street is to support our existing businesses and recruit new ones. Why should people want to be a part of Downtown? What have you learned that can help that person on the verge of making the decision to start his or her own legacy as a downtown business? I am a staunch believer in strengthening from your inner core. Whenever I travel, I am always looking for a downtown area, and I judge the vibrancy of a community on the look and feel I get from the downtown area. 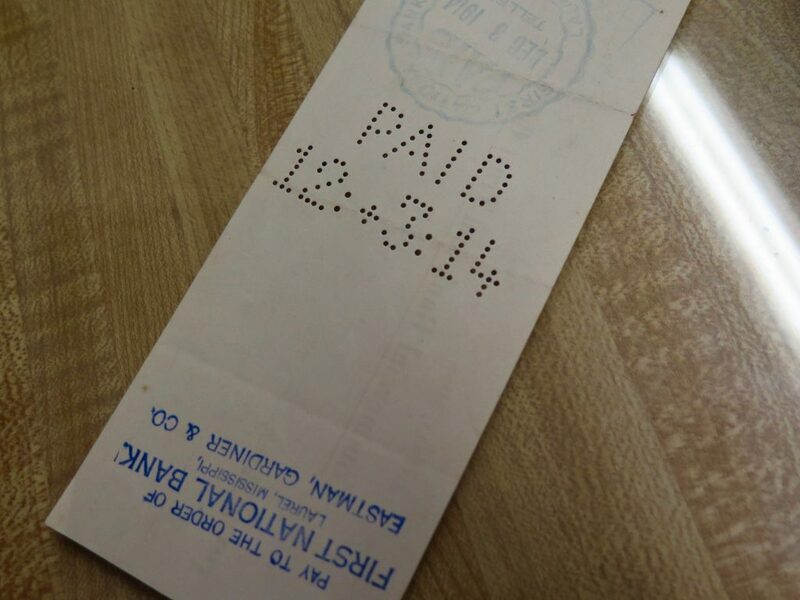 Because of this, what is good for downtown Laurel, is good for all of Jones County. As downtown Laurel continues to flourish, this will lead to increased tourism and economic development, which in turn will provide a higher quality of life for our local families and businesses. My recommendation to everyone is that they get involved. This may be as simple as volunteering, or as complex as purchasing downtown property and starting a new business. While it seems that downtown Laurel is reaching critical mass, I believe that this could be just the beginning of something much more substantial for our community. This requires involvement at every level – families, entrepreneurs, the business community and local government must be in lockstep if we want to take downtown Laurel to the next level. When I was in high school, I was Jones County’s Jr. Miss, and I was invited to every ribbon cutting and ground breaking ceremony in the county. One of my favorite events to attend was the ribbon cutting for Misty’s The House of Style. I remember watching the construction of the store with my youth group from our Sunday night hangout, McAlister’s Deli, next door. The instant I walked into Misty’s store, I knew I was some place special. Not only were there beautiful clothes and creative store displays everywhere I turned, but there was such a warm and welcoming atmosphere too. Five years later, I was preparing for the Miss Mississippi pageant and Misty helped me find the perfect outfits and accessories for arrivals and autographs parties. And in 2006, when I got married, Misty’s came to my rescue once again. Hers was the only store in town that carried Spanx at the time, and I can honestly say, there would not have been a wedding without them. Anytime I’ve shopped at Misty’s I left her store feeling more confident than when I arrived. It takes a special person to make others feel that way. 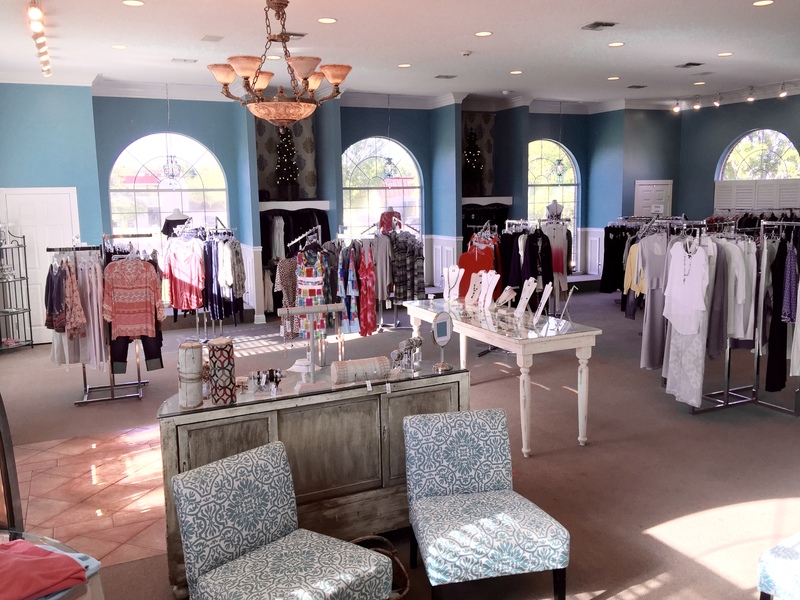 Her demeanor has permeated her staff as well, making Misty’s a true shopping destination. Read our interview below and you’ll see just why Misty Foster is a leader in our community and her brand leaves a legacy for other retail stores to aspire to. 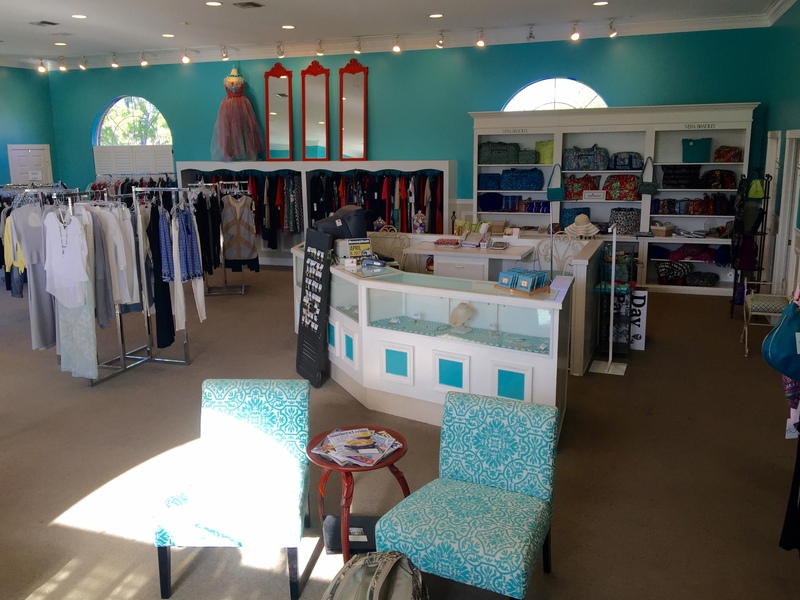 Misty’s is an upscale women’s clothing store. Here at Misty’s, we pride ourselves on our dedication to our clients by offering the utmost customer service. It’s known that we go the extra mile for all of our customers. 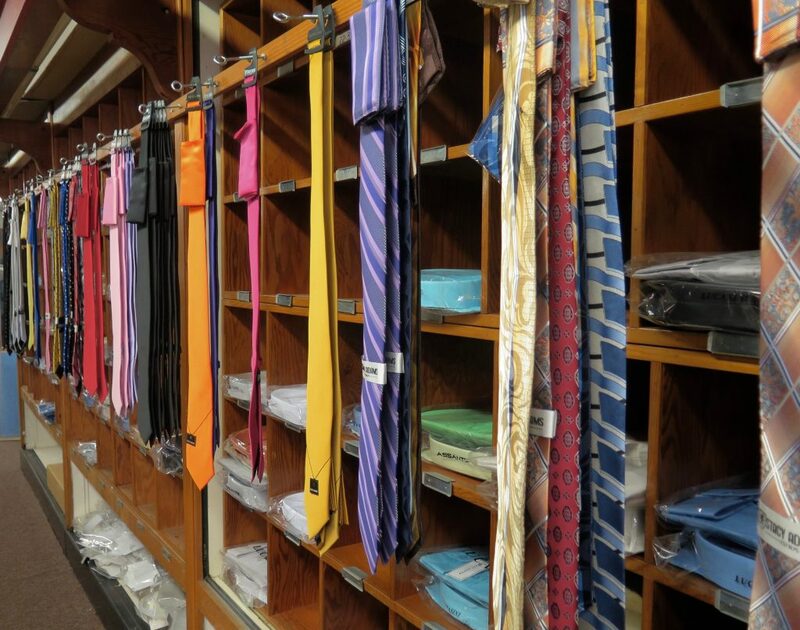 Not only do we sell good quality clothing, but we also offer in-store alterations on items purchased here. You will never purchase a gift here and be charged for gift wrapping. When shopping at Misty’s, you can always count on a friendly smile and a hug around the neck. As a young girl, I always envisioned myself as a dentist, which is totally crazy because I’m very fearful of having dental work done. While in college at The University of Southern Mississippi, I changed my major from science to fashion merchandising and marketing. While in college, I worked in several retail stores and loved it. After I graduated from college, I was hired by Mrs. Joy Roberts to work at her store, Roberts, in the North Laurel Shopping Center. I had the best experience working for her and meeting so many ladies that I had not known prior to this job. Although I loved my job, I felt like I had a calling to open my own business. And the rest is history! How did your store come to be in its current location. Is this a structure that has been repurposed or a new building? As I began the challenge of opening a store, it was also a challenge finding the right place. My mom and I looked and looked at so many buildings in downtown Laurel and surrounding areas but decided that a free standing building was the way for us to go. We purchased the lot next door to McAlister’s Deli and have been happy with our location. It’s the gateway to our new and wonderful downtown Laurel with a lot of traffic. We have two entrances that make it easier for our customers to access the store, and a big parking lot. How do you think Misty’s will be different five years from now? Laurel is a wonderful small town with the friendliest people, who are open to change and making our town better. With our new HGTV series, Home Town, we look forward to many new people visiting and settling down in our area. This is nothing but good news for our locally owned businesses and our economy. In five years, I expect great things for not only Misty’s, but our entire town. Who do you think needs to hear your story and why? Everyone has a dream in life. My wish and prayer everyday is to help someone feel good about themselves. I want my customers to feel loved and appreciated every time they walk through my door. It’s important for my shoppers to know that they are my first priority. 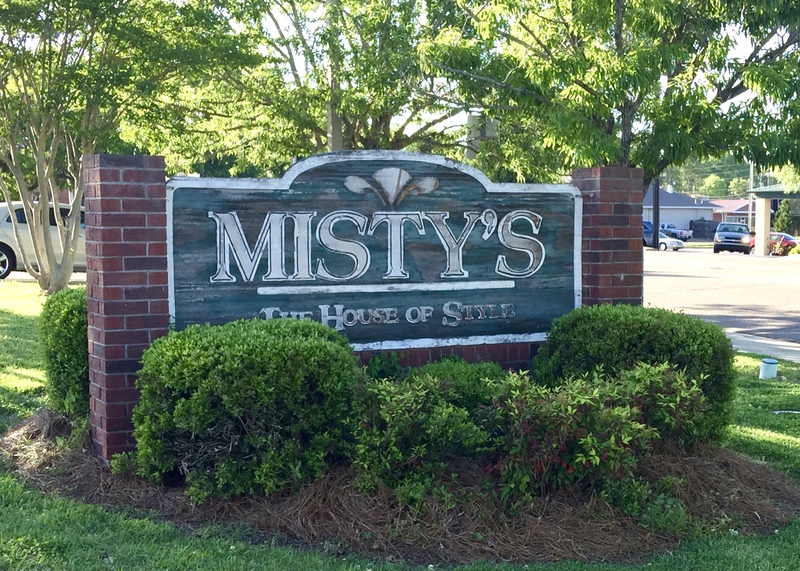 If you are looking for great customer service and something special that you don’t see everywhere, then Misty’s is the place to shop. If we don’t have what you are looking for, we will point you in the direction of another wonderful locally owed store. What is your best advice for those looking to participate in the growth, revitalization, and restoration of Downtown Laurel? I would first start by joining the Laurel Main Street organization. Being a part of this organization means that you are dedicated to making Laurel a better place to live. They have so many people who have put their heart and soul into making a better downtown. All it takes is one phone call to get involved in the many projects and events throughout the year. If you’ve spent any amount of time in Laurel, then you have surely been through the doors at Lee’s Coffee and Tea. It’s our very own Cheers, where everyone knows your name…or at least they will before long! It’s the perfect place for a quiet cup of coffee, lunch with a friend, or an afternoon pick-me-up. 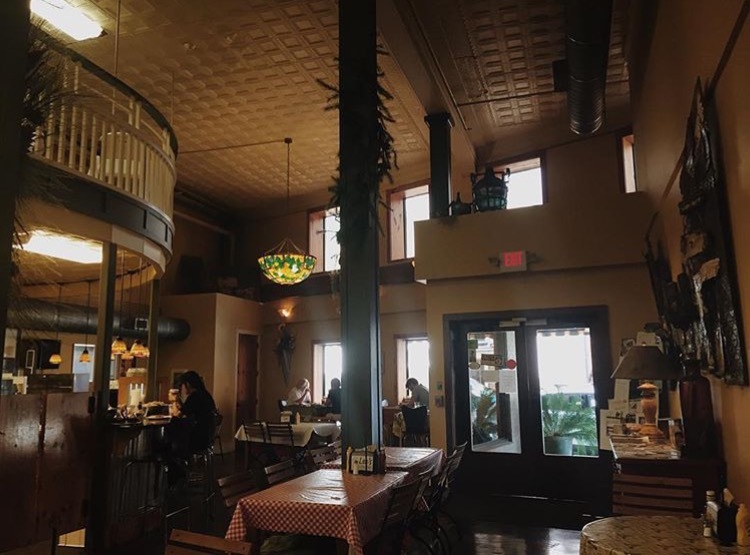 When you walk in and hear the familiar jazz music playing along with chatter as friends catch up over coffee or colleagues work out their latest business plan, you can’t help but feel a sense of home. What is Lee’s Coffee and Tea? A place for people who are looking for a casual gathering of family, friends, or business associates with fresh delicious food, coffee and tea. Lee L. Barnett,Aunt Lee, was born here and she has always had a special affinity for bringing life back to downtown. For many years she always wanted a tea shop and would drive down the streets and look at the old buildings and think of the possibilities. How did Lee’s come to be in Sears and why? She purchased the old Sears building in November of 2006. With the help of her family, Clark Construction, and the talents of Mrs. Diane Owens the building was restored. 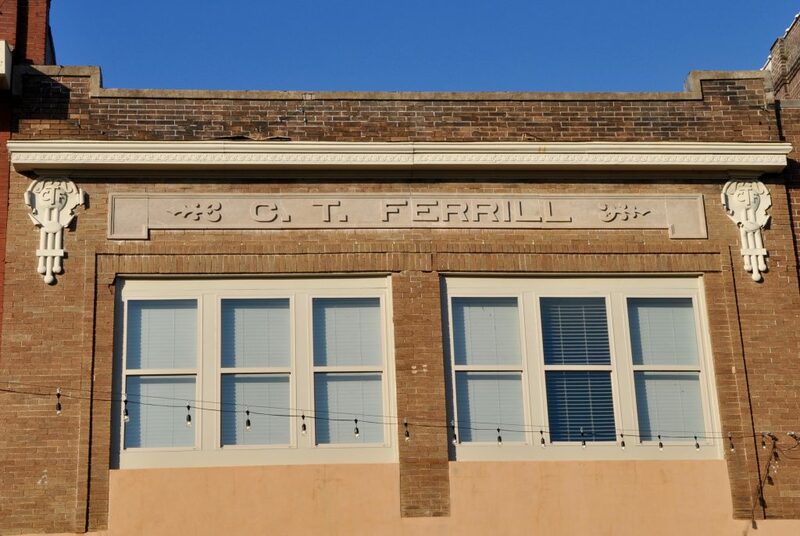 The building not only houses Lee’s Coffee and Tea, but business offices, conference rooms and five beautiful apartments in the four story building. 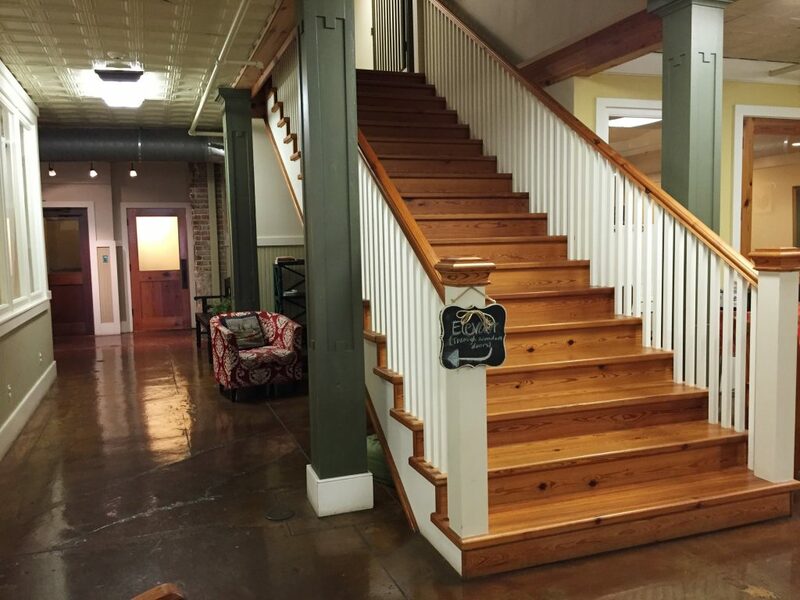 One of the things that Aunt Lee was careful to restore to its original state was the staircase made with southern yellow pine which represents this area. How do you think Lee’s will be different five years from now? Aunt Lee lives day by day and would hope that five years from now, Lee’s will still be known for its high quality food and service. Who do you think needs to hear your story? Young people with all of their energy. Aunt Lee would like to see more young people invest in downtown. What is your best advice for those looking to participate in the growth, revitalization and restoration of Downtown Laurel? Have faith. It is a tremendous undertaking to start and open your own business. It takes a lot of energy to open and keep it running smoothly. There will be hard days but keep your faith. In the end it is worth it to see how much the good people of Laurel and Jones County as well as guests out of the county, state, and country enjoy your services. Why should people want to be a part of Downtown? Downtown is a great place for anyone wanting to open their own business. With other businesses, cafes, and restaurants, a synergy is created and it’s all a very good environment. Thank you, Aunt Lee, for sharing your story with us and for following your dream of creating a coffee and tea shop in Laurel. 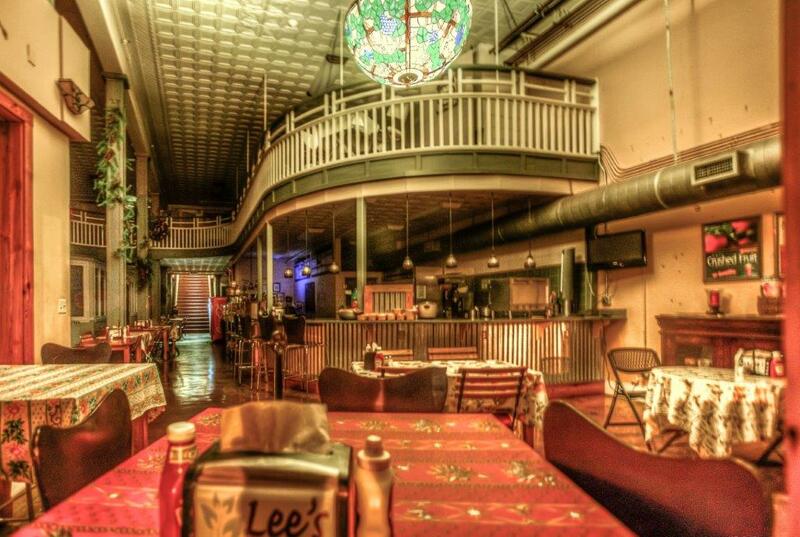 Lee’s is very much a cornerstone for our downtown and one that we hope continues to thrive for years to come! 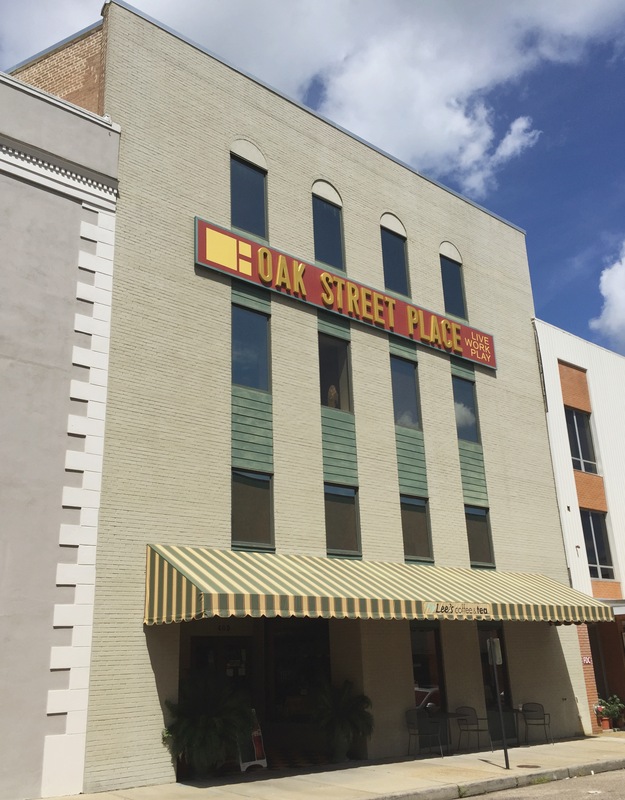 When you think of starting a business in a place like Downtown Laurel, you envision old buildings, beautiful facades and hometown folks walking the sidewalks. You imagine a place that is growing and in the midst of restorations, but whispers of times gone by. But, every once in a while, you get the chance to experience a true reminder of those times. You get a chance to be a part of the legacy held so dear by those who spent their childhoods beneath the towering buildings, who walked to church down 5th avenue beneath the oaks, and who came of age while the Pinehurst Hotel was still standing guard on the hill. You see, it’s these folks who know what it really means to see Downtown Laurel shedding years of neglect and coming back into herself. It’s these folks, folks like Rodney Rowell, owner of Lott Furniture Co., who know what the future of our beautiful Downtown holds. It’s these folks who have seen where we came from, and can truly envision where we are going. For those like Rodney, Downtown Laurel is more than the days ahead, it is over 100 years of history, stories, lives lived and experiences had. 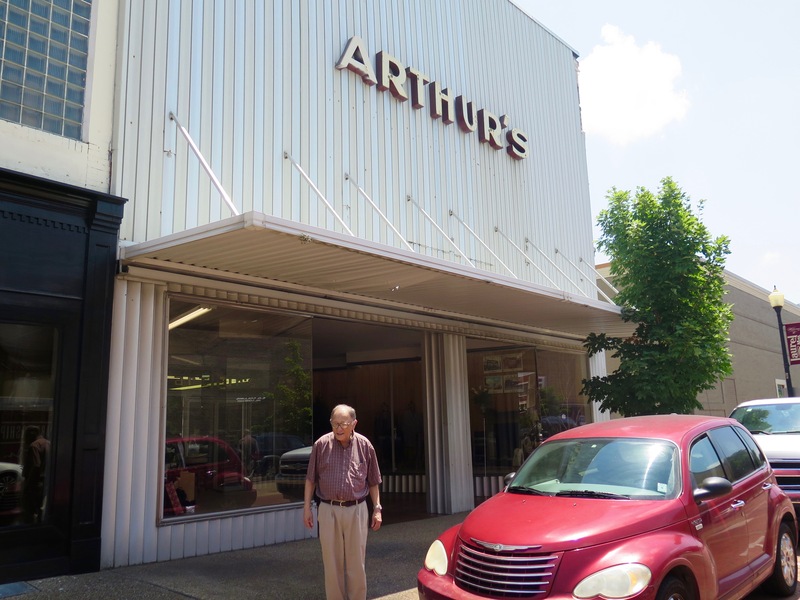 For Rodney, it is his family’s legacy, a fixture in all of the old stories, and a setting for a childhood spent in Mississippi’s Downtown. 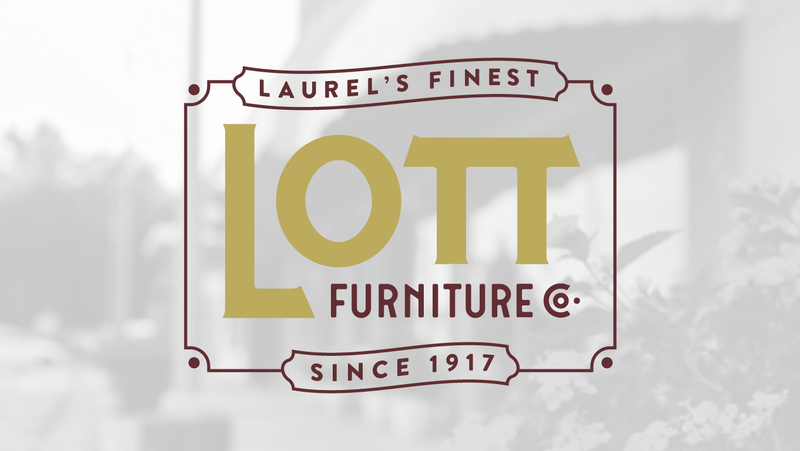 In 1917, Reuben Lott opened the first Lott Furniture store on Front St. At the time, Front Street was the center of life in Laurel, MS. Located directly across the street from the historic Train Depot, all who lived, worked, shopped and played in Downtown Laurel would pass by its doors. They would stop in to chat with the employees, and to envision the wares held there brightening up their own homes. For 100 years the legacy of Lott Furniture Co. has lived on, a quiet cornerstone ever present through years of change, struggle, and soon – revitalization. Lott Furniture is a beacon of our history, and a sign of the strength each new business could achieve. Celebrate with us as we remember 100 years of leadership and resilience. Join us as we celebrate 100 Years of Lott Furniture. Sign up here for updates, to view the new Lott Furniture brand, and to become a part of the celebration to come. Welcome back to our Legacy & Leadership blog series. We’ve taken a break the past few months to focus on all the great things that have been happening, but we want to pause and once again take a look at our history. 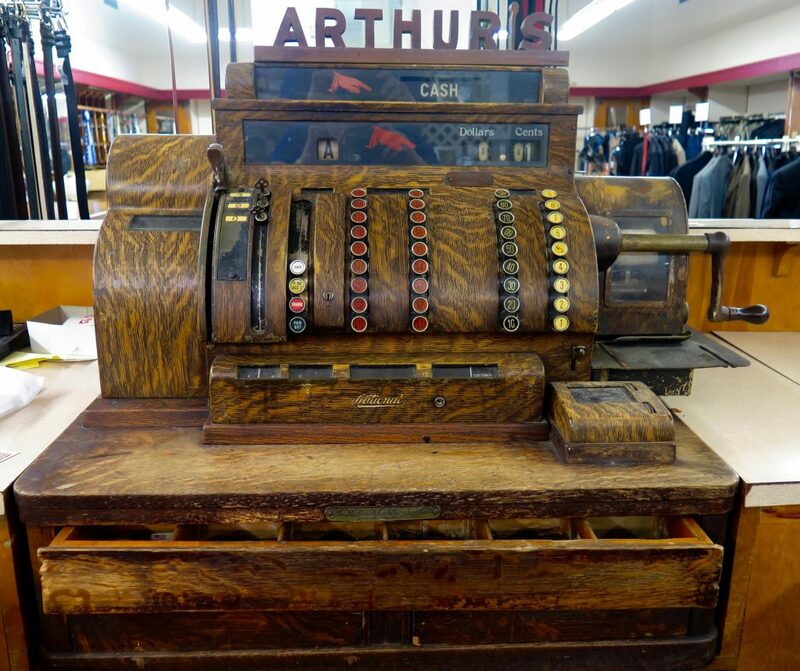 Arthur’s on Central Avenue is a store that holds some wonderful stories that we wanted to share with you! 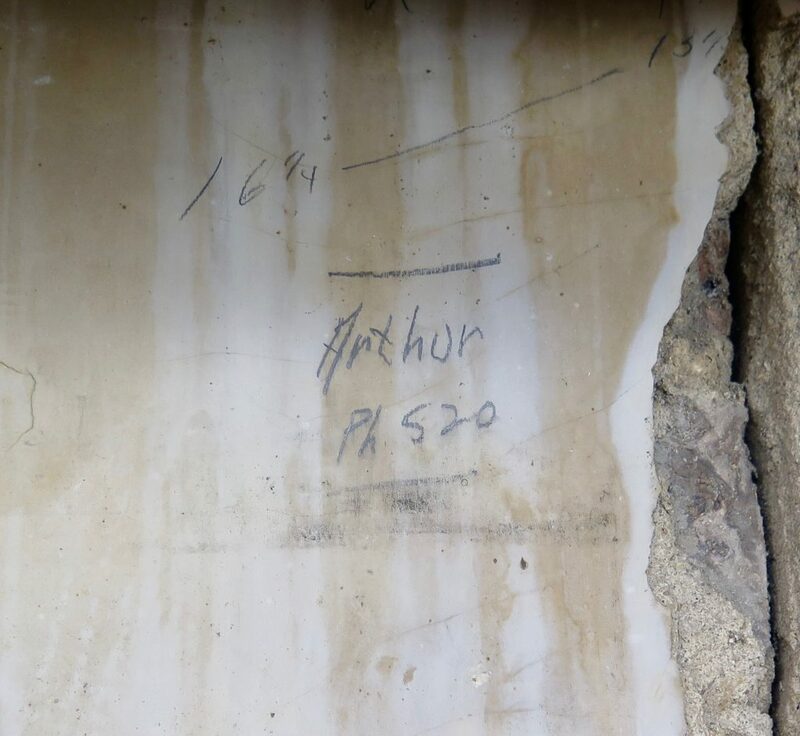 Harold Frohman’s father founded Arthur’s over 80 years ago. 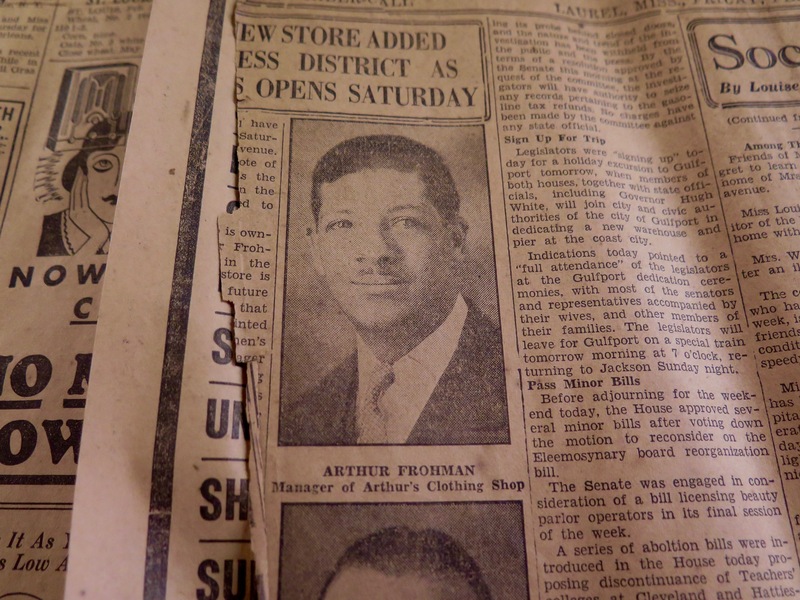 He ran the business for 59 years before passing it down to Harold’s older brother. Now Harold has been the owner for the past twenty years! The Depression injured Harold’s paternal grandfather’s business, so his father decided to come south. He worked for his maternal grandfather, met his soon to be wife, and started Arthur’s. What has changed since Arthur’s inception? Originally, the store only had one pair of pants in each size because during The Depression manufacturers did not have any money either. 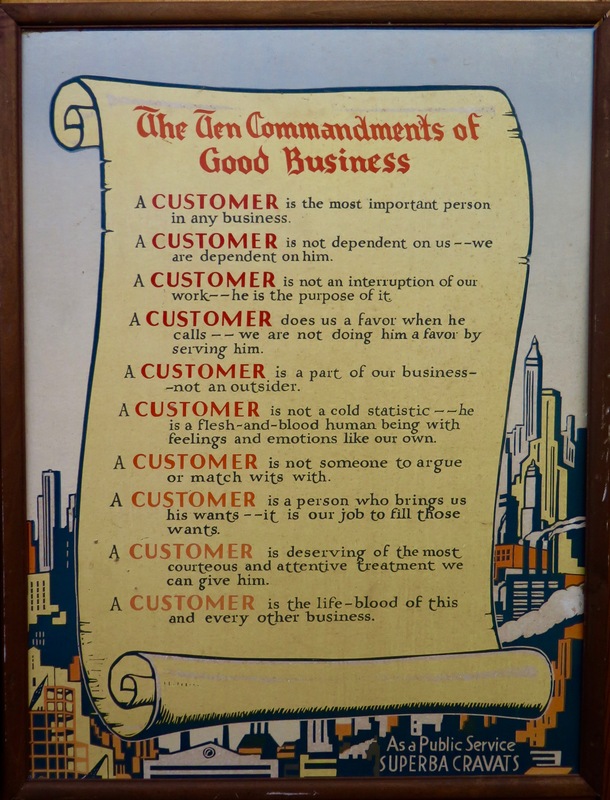 Although people and times have changed over the years, Harold points out a sign, The Ten Commandments of Good Business. He says nothing in business has changed. Based on what you have learned from running Arthur’s, what is one piece of advice you would give to someone? Treat others the way you want to be treated. This is a rule that we can apply to all people and not just customers. What is one thing you’d like to see from future generations? Laurel needs young people to choose to invest in their hometown; that’s how our future will be secured. This is the one thing that will help our community thrive. We need people that are willing to invest, be positive, and be productive! Thank you, Mr. Frohman, for sharing some of your wisdom and history with us.